Thanjavur, one of the top places to visit in the south Indian state of Tamil Nadu, rose to prominence during the epic reign of the Chola dynasty from the 9th to the 13th centuries. After the fall of the Cholas, it was the Nayaks who next made a significant impact when they gained control of Thanjavur in the 16th century. Their reign lasted a century, until defeat by a strong Maratha warrior clan from Maharashtra, the Bhonsles, who established their kingdom there. The various rulers all had one thing in common — patronage of the arts and crafts. Collectively, they transformed Thanjavur into a distinguished cultural hub that continues to nurture artisans and performers. These top things to do in Thanjavur reflect the city's heritage. It's officially called the Bridhadishwara temple, but there's an obvious reason why this temple is colloquially known as the Big Temple (Periya Kovil in the local language). Big is an understatement though, it's enormous! Not surprisingly, the temple is Thanjavur's biggest (pardon the pun) attraction, one of the top temples in south India and a UNESCO World Heritage Site. What's also remarkable is that the temple is more than 1,000 years old and has withstood numerous earthquakes. Chola king Raja Raja I built the temple out of granite in the 11th century, as a symbol of the Chola dynasty's unrivaled might. So many things make it an engineering marvel. Not only was the granite transported from a quarry more than 50 miles away, the stones are held together simply by interlocking and lime mortar. An 80 metric ton solid stone dome sits on top of the temple's 216 foot high tower — how it could possibly have been placed there is mind-boggling! Granite is also one of the hardest stones to carve, and yet the temple is covered in intricate designs and sculptures. Other highlights are musical pillars, murals from the Chola dynasty, and a huge stone statue of Lord Shiva's sacred bull. The temple complex is open daily from 6 a.m. until 8:30 p.m. You could easily spend a few hours exploring its spacious grounds and relaxing there. Around dusk, when the temple becomes illuminated and auspicious rituals are conducted, is particularly evocative. Photography is permitted. King Raja Raja I was an ardent devotee of Lord Shiva, Hinduism's powerful god of creation and destruction. The Big Temple and Lord Shiva's bull aren't the only things that are notably large. The Big Temple's inner sanctum also contains one of the biggest Shiva lingams (stone symbols of Lord Shiva used in worship) in India. The polished black lingam is nearly four meters (13 feet) tall and is said to weigh about 20 metric tons. Legend has it that the king wanted a suitably impressive symbol, which outdid other temples, to honor Lord Shiva whom he worshiped in the form of Rajarajeshwara (Lord of Raja Raja). Do note that the inner sanctum remains closed daily between noon and 4 p.m.
Thanjavur’s other major landmark is the rambling 10-acre Royal Palace Complex, located within walking distance of the Big Temple on East Main Street. You can get a great view of its ornate exterior from the road. If you go inside expecting a lavish palace, you'll be disappointed though. However, there are still many interesting things to see. The lack of opulence can be accounted for by the fact that palace was originally built as a fort by Nayak rulers in the 16th century. The Marathas subsequently renovated and enlarged it, and descendants of the royal family still live in a portion of it today. They've put an array of personal regal memorabilia on display in their private Rajah Serfoji II Memorial Hall museum, open daily from 9 a.m. to 6 p.m. It's the colorful Durbar Hall, with its extravagantly painted pillars and arches, that's most spectacular though. Tickets for the whole palace complex cost 200 rupees for foreigners and 50 rupees for Indians. There are additional fees to use a camera. An art gallery was established in 1951 in part of the palace complex, to ensure that archaeologically important sculptures remained in the area. Given the dilapidated state some of the palace is in, the gallery is surprisingly good. It features a substantial collection of hundreds of bronze and stone Chola sculptures from the 9th to the 13th centuries. A statue of Serfoji II, the most notable Thanjavur Maratha ruler, is stationed in the middle of the gallery. There's also a whole section dedicated Lord Shiva in his cosmic dancer form of Nataraj. The quirkiest exhibit is the out of place bones of a 92-foot whale, which was washed ashore near Tranquebar in Tamil Nadu in 1955. The art gallery is open daily from 9 a.m. to 1 p.m. and 3 p.m. to 6 p.m., except on national holidays. Separate entry tickets cost 50 rupees for foreigners and 10 rupees for Indians. Government-run, medieval Saraswathi Mahal Museum also occupies part of the palace. It was set up in the 16th century as a royal library for the Nayak kings and is apparently one of the oldest libraries in Asia. The library was extensively developed by the scholarly Marathas during their reign and recently spruced up, which has eliminated some of its stuffiness. It has a priceless collection of more than 60,000 volumes of rare books and manuscripts, including palm-leaf manuscripts. Unfortunately, only a selection can be seen by the public. Other items include royal records, atlases and maps, pictures, drawings, and Thanjavur paintings. An audio visual theater was added in 2016, and an insightful documentary that narrates the history of Thanjavur and the palace is screened there. The museum is open daily from 10 a.m. to 1 p.m. and 1:30 p.m. to 5:30 p.m., except on Wednesdays and national holidays. There's no better place to immerse yourself in Thanjavur's heritage and culture than Svatma. Undoubtedly the ultimate place to stay in Thanjavur, this extraordinary property was a derelict unoccupied Colonial mansion before its architect owners found and meticulously transformed it into a hotel over 10 years. The property is filled with antiques and incorporates bits of other salvaged heritage buildings, such a porch from a 220 year-old house in Tamil Nadu's Chettinad region that now shelters the hotel's bar. One of the owners is also a talented classical Bharatnatyam dancer and this carries over to the hotel's focus on the arts. Classical music and dance recitals regularly take place at the property, and it has galleries that house bronze statues and musical instruments. In addition, guests are offered experiences to enable them to connect with Thanjavur's people and culture. These include culinary classes, demonstrations from artisans, Vedic chanting, dance classes, chamber music concerts, and temple visits. Other facilities are a swimming pool, Ayurvedic spa, and two restaurants. What's more, the hotel is eco-friendly. It employs local staff, operates as a zero-waste green building, and supports a local charity that encourages training in the state's traditional arts. The accommodations consist of two wings — a heritage wing with seven suites, and a more contemporary adjoining new wing with 31 rooms. Rates start from 12,500 rupees per night for a double with breakfast, fruit and cookie platter, and wireless Internet. Thanjavur is most renowned for its unique paintings and dancing dolls. You'll see them for sale all over the city. The distinctive Thanjavur-style of painting, introduced by the Nayaks and refined by the Marathas, features Hindu deities and gold foil overlay. The dancing dolls have bobble-heads that shake. To buy authentic items at fixed prices, head to government-owned Poompuhar on Gandhiji Road near the railway station. Otherwise, the many shops in the main street around the palace and in the vicinity of Punnainallur Mariamman temple sell all kinds of handicrafts. Kandiya Heritage, opposite the palace, is a popular place to shop. If you're not content only to shop but want to learn how the handicrafts are made, there are a number of fascinating artisan workshops you can visit. This full-day guided tour will take you to see the making of dancing dolls and Thanjavur paintings, a bronze-casting workshop, as well as crafting of the traditional Thanjavur veena (a musical instrument with strings). It ends with a trip to the historic nearby town of Nachiarkoil, where hundreds of artisans are engaged in the ancient art of lamp-making. The influence of the Marathas wasn't restricted to the arts. They also contributed their own style of cuisine. You may hear that the ubiquitous and beloved south Indian dish, sambar, actually originated from the Maratha royal kitchen! The story goes that the chefs replaced unavailable kokum, a Maharashtrian staple, with local tamarind while making amti daal (a tangy lentil preparation) and added extra vegetables. The claims even go as far as to say the dish was named after Maratha ruler Sambhaji. Nevertheless, the Marathas did create their own individual style of hybrid Thanjavur Maratha cuisine. It can be sampled at Svatma's Aaharam restaurant (drop in and splurge on lunch even if you're not staying there), where local Maratha families have contributed their recipes and cooking skills. Otherwise, head to Thillana at the Sangam hotel on Trichy Road for an elaborate Thanjavur thali (platter) or south Indian meal. Sahana at Hotel Gnanam on Anna Salai Market Road is another recommended option for lunchtime vegetarian thalis. Boutique Tanjore Hi, opposite the palace, has a spectacular rooftop restaurant that uses organic ingredients as well. South Zone Cultural Center was founded by the Indian government to preserve and promote the country's heritage, with special emphasis on folk arts. It encompasses the whole of south India, from Andhra Pradesh to the Andaman and Nicobar islands. The 25-acre property is located off Medical College Road, about 10 minute drive southwest of the Big Temple. It's decorated with sculpture installations, and also has an art gallery and auditoriums. The best time to go is when one of the many festivals is being held. As well as performances, there are handicrafts for sale and regional food stalls. The cultural center is open daily from 9:30 a.m. to 6 p.m., except for Sunday and public holidays. The entrance fee is around 10 rupees. Thanjavur isn't all about temples! It has one of the oldest churches in South India too. Schwartz Church was built by Danish missionary Frederick Christian Schwartz in the 18th century. The most interesting feature of the church isn't its plain white neoclassical architecture but an unusual marble tablet on the western side, which portrays Schwartz on his death bed with his ministers and Maratha king Raja Serfoji II by his side. The house that Schwartz lived in sits to the northwest of the church and is now a school. Schwarz Church is separated from the Big Temple on the north side by Siva Ganga Garden. It's a popular place for locals to spend time as it has a playground for kids. 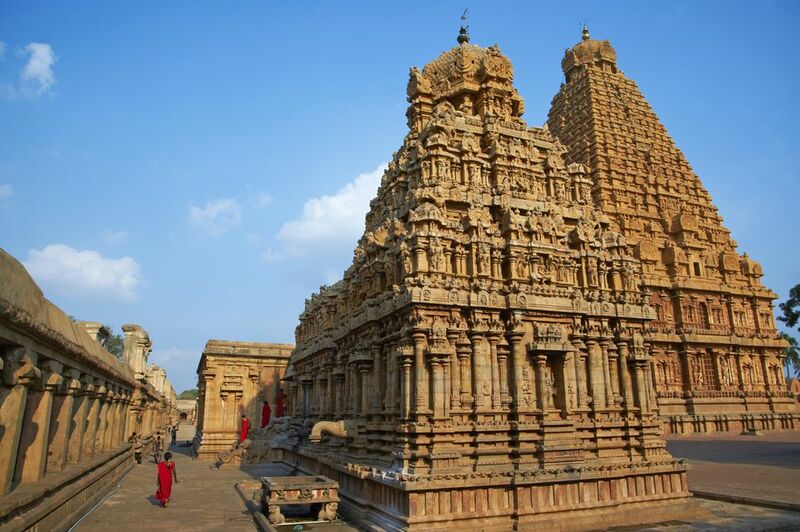 If you were impressed by the Big Temple and are keen to see more superb temples from the Chola era, it's worth taking a day trip along National Highway 36 to Kumbakonam and Gangaikonda Cholapuram. There, you'll find the other two Great Living Chola Temples that are part of the UNESCO World Heritage listing along with the Big Temple. Gangaikonda Cholapuram is about a two hour drive northeast of Thanjavur. The city (which is now a village) and its royal temple were constructed by Rajendra Chola I (son of Raja Raja I) in the 11th century, not long after the Big Temple. Although it's not on the same scale as the Big Temple, the temple has similar graceful architecture and an enormous stone Nandi (bull). The Airavatesvara temple at Darasuram, near Kumbakonam, is about halfway between Thanjavur and Gangaikonda Cholapuram. Raja Raja Chola II built it in the 12th century, and it stands out because of its magnificent detailed sculptures. There are plenty more temples to see in Kumbakonam, which was also a capital of Chola kings. So, do allow plenty of time to explore. Those who are especially interested in classical music should plan their visit to Thanjavur to coincide with the Tyagaraja Aradhana Festival in the third week of January, or Festival of Sacred Music in February. Both are held in Tiruvaiyaru, about 20 minutes north of Thanjavur alongside the Kaveri River. The route there is picturesque with multiple bridges. The venue for the long-running Tyagaraja Aradhana Festival is the tomb of 18th century saint-composer Thyagaraja, who resided in Tiruvaiyaru. The festival is held in his honor and hundreds of musicians turn up to perform his Carnatic music. Entry is free. Alternatively, the newer three-day Festival of Sacred Music offers a fusion of Carnatic, Hindustani and World music. It was established in 2009 by the culturally-focused Prakriti Foundation, based in Chennai, as a community initiative to showcase various forms of music and promote responsible tourism in the town. The festival is open to everyone and tickets aren't required.